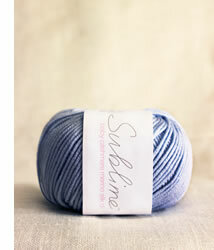 This yarn is perfect for both hand knits and crochet garments and for gorgeous baby blankets and soft toys. It is a standard double knitting yarn and can be used with any of Sublime double knitting patterns for women, girls and boys. Baby cashmere merino silk dk is machine washable in baby garments and we recommend that it is hand washed if used for children and adults. This gorgeous yarn is made in Italy – naturally..